HTML5 Template Design for Blog. This is right time to adopt HTML5 semantic markup tags into your website design. W3C has conducted a study of over billion websites and found that the most of common div IDs and classes are footer, header, menu, content, title and nav. HTML5 semantic markup elements that can convey the purpose of the element to developers, browser and search spider algorithms. The most important deceleration element, this helps your browser to understand what kind of HTML version it is trying to parse. 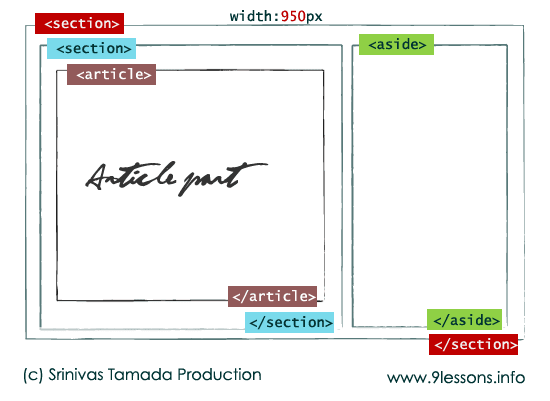 Web layout divided into four horizontal parts are Hearder, Nav, Section and Footer. Now working with an unorder list <ul> tag. Here article title is the most important and top level, so title should be in <h1> tag. This page should be with multiple article title links with little description, so that reader can quickly find more information. W3C standards specifying <h1> tag use for top-level heading. For implementing lower version browser like Internet Explorer 7 and 8, you just include modernizr.min.js after style sheet inside header tag. download link. Now this code works fine with Internet Explorer lower version. Note: Modernizer doesn't support inline CSS. may i implement these code into my self-hosted wordpress site..? 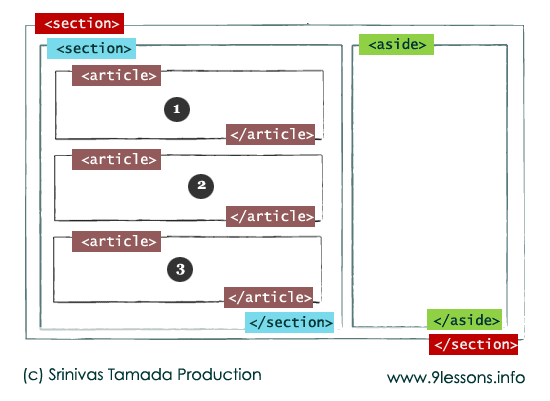 Nice article I think Blogger templates also works on HTML5 specification. great post :) thank you ! Nice Post Srinivas!! HTML5 is really awesome looking more articles..
Ahh...this dosen't reduce the work of a developer, it's a bad practice...and also many people still uses IE as a browser...so the dosen't mean to use..
Well basic but in detailed, well written code man. Thanks for sharing this useful information! 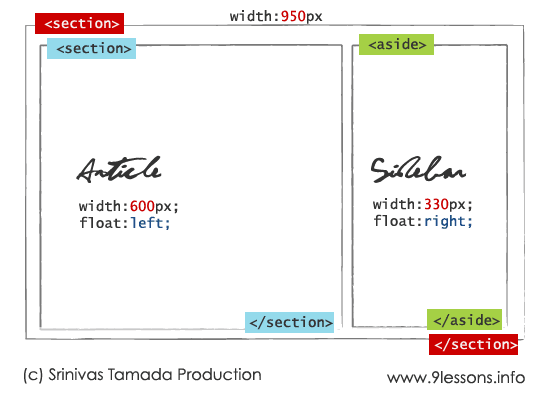 Good article explaining the semantics of HTML5. In "Step 3 / Home Page" you mention that "W3C standards specifying h1 tag use for top-level heading", but you use h2 tag in the example code. Which one is the correct? <h2> for Home List Page. thank you for this design template. very useful. will try. thanks again. How can i use this template on my blogger blog...? Nice article about HTML5, I as an new bee to HTML5, it helped me a lot. In the css "header, footer, section, nav" is that a misspell on the "display: blocks" tag? The right way is "display: block". Am i wrong or just getting confused by something? Thanks, For a beginner web designer like me its heaven. Thanks again Srinivas. You can not use the 'header' section descriptor (if that is what it is called-my bad not up on new html5 terms) for displaying <start article, <start header, </end article, </end header, in a content/article section BECAUSE when you style the header parts in your stylesheet every element designated as 'header' will be that color and size etc. So if I make a header as (what a header should be) the top section, then all the headers in my articles are going to be the same dimensions as my Header header at top. Yes I guess you could add an id to each 'article header' but that would defeat the pupose of having section tags. It would be more sensible to just go with H1 and H23456 instead since that is what H header tags are built for. Nice post. But I am facing some problem in older browsers. Because those do not support html5. How can I overcome from this proble? gr8 coding bro! sometime I'll implement this on my blogger blog. I am learning and practicing HTML5 and CSS3 and i found this article is really a great help for beginner.A VERY BIG THANKS for this valuable content. Good work Srinivas and Keep it up ! Great! I have easier way to change a template now. Thanks! Awesome Tutorial.. I really found it very useful.. Please customize a html5 template for blogger blog. on my blog there is one error, and it is caused by code . how can I fix the error? I LOVE it thanks man. Think you post more like this in the future? 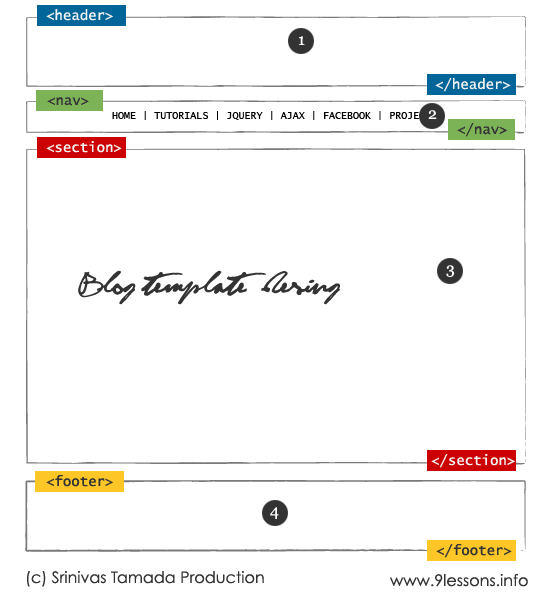 hi, Nice article I think Blogger templates also works on HTML5 specification. Nice article but i don't know how to use it in Blogger. Can you help me please. Where was this website when I needed it!?!? Well I will archive it til it is needed again. Nice article, thanks for the information. It's very complete information. I will bookmark for next reference. Thanks for sharing this template designs, this being very useful i am surely going to use it.